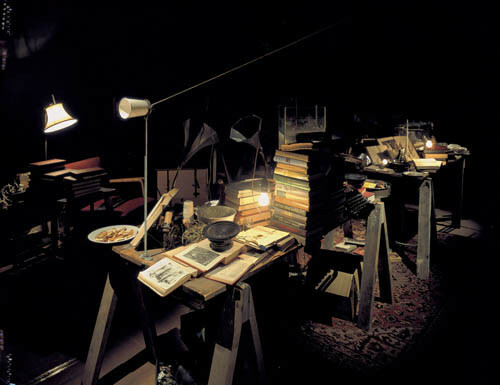 'The Dark Pool,' Janet Cardiff and George Bures Miller (1995). Photo by Cardiff and Miller. Since I started work as reviews editor in February 2010, the office I share with Writers House director and Jacket2 associate publisher Jessica Lowenthal has been transformed into a library of recently published poetry books and chapbooks. With the help of Jacket2 editorial assistants, including Emily Orrson and Sarah Arkebauer, 500 presses were contacted, more than 4,000 emails were exchanged, and nearly 750 books and chapbooks have been received, catalogued, and shelved. Sometimes it feels like Borges’ Library of Babel in here, and other times, like when the middle bookshelf broke in half and books by poets from Barbara Henning to Erín Moure tumbled onto the floor, it feels more like Richard Brautigan’s constantly expanding library in The Abortion. The Jacket2 review copy library includes titles from 1913 Press to Zone 3 Press, from Adventures in Poetry to Publishing Genius, from Narrowhouse to Mummuu House. Parcels stamped “media mail” arrive daily from locales as far as East Sussex, England, and Chiang Mai, Thailand. More than 150 reviews have been written and submitted, so if you’re a reviewer, or an author of a book that has been reviewed, thank you for your patience as our editorial team reads and responds to your work. New reviews will be posted once or twice a week. And, you can check here, on the Jacket2 Commentaries page, for updates about recently received titles. Note: for more on Janet Cardiff & George Bures Miller's installation The Dark Pool, visit their homepage. And, in issue 2 of Horizon Review (Salt Publishing), check out Kathryn Brown's piece: "The House of Book Has No Windows: Janet Cardiff and George Bures Miller"